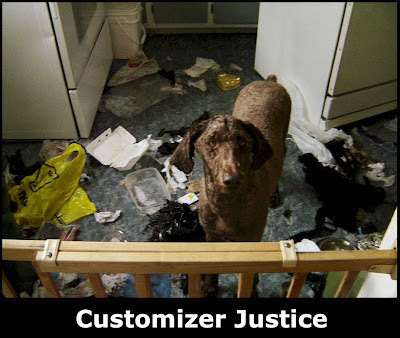 I have referred to my customizer a few times on this blog. The first time was when he brought his formidable skills to bear in updating my sunglasses until they were truly cutting edge technology. The second time the customizer worked on my glasses, however, his genius was beyond my grasp and the work he did finished my glasses off entirely, which contributed to me looking silly in public. Believe me, I need no assistance with that kind of thing. It was at that point that I determined, with a heavy heart, that he had gone somewhat mad and I could no longer allow him to work on any of my gear. 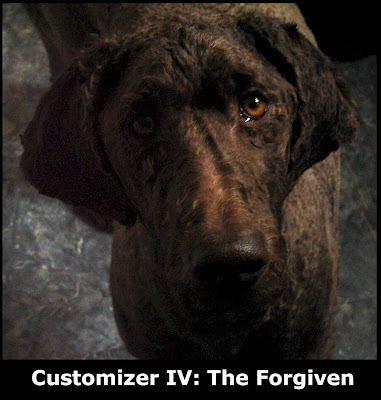 Months passed in relative peace as the customizer grew more mature. His experiments on household objects came to a near stop. Recently, however, the tables were turned. 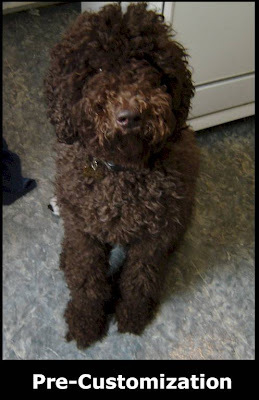 My friend had become unkempt and out of control in the grooming department. Drastic action was required and I ended up customizing him. The results were dramatic and his revenge was swift. But enough words. To the Pictures! Great "custom job". 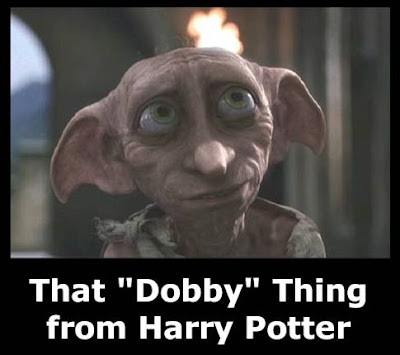 And I think Dobby would be a great name for a dog. He's a loyal and true friend. OMG. Hats off for keeping your cool. I would have made the rest of the kitchen match the mess already on the floor. If you rode Today, good luck on the ride home!! I customize Shaggy every year. last year, i bought my own widget for customizing Lea and Shaggy. Shaggy has customized many of my things before I customized him. 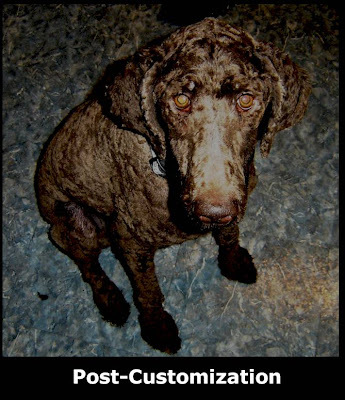 He customized my prescription glasses when I was out one evening and didn't take him out for his walk, when I lived in an apartment. He also has customized a whole brick of cheddar, Lemon Bars, my daughter's dinner, my last bowl of spicy Indian dinner, jackets' zippers, toes of Timberland shoes (not sure why Timberlands) and the list goes on. Oh that reminds me, I need to customize him, again, in a month or two. So, who is the real customizer? Me or Shaggy? PS. The doggy is adorable! jeff - yeah, an annoying yet loyal and true friend. Skyers - I wouldn't want to see those End results either. Of course I rode today! I've been watching the weather and getting kind of pumped for the ride home. There's a rare tailwind! Chandra - Sheesh! Keep your widget safely stored, he may use it to customize your beard off while you sleep... he seems to have done everything else. Mrs. Doohickie says, "That poor baby!" Doohickie - Well I'm glad someone feels sorry for me. Get his balls cut off... that'll show him. That customization was already done some time ago... poor guy. Couldn't you have waited to shear off all the poor guy's cold weather insulation until the temp climbed up near zero? My own customizer only recently rendered 2 bell citi helmets unrecognizable...along with a PB Superflash, and a roll-up keyboard for the laptop. He was so goofy and proud of what he'd done, I couldn't stay mad at him for more than 30 minutes. Steve - He was starting to mat in a bad way. We had to do the deed and get him a sweater. I hate dog sweaters. jtgyk - I'm glad I'm not the only sucker for a happy dog. Fortunately, my dog is far too lazy to customize anything. Funny guy really got back at you, just as you were feeling smug, huh?